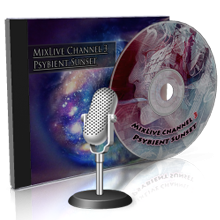 Psybient Sunset explores Darkpsy, Psychill, Psybient and Goa Trance. Join us as we rediscover those classic sounds from some of the world’s finest Psybient artists. Aes Dana, Androcell, Capsula, Kick Bong, Carbon Based Lifeforms, H.U.V.A. Network, Sync24, Shpongle, Tripswitch, Zero Cult and more. A unique collection of sounds that take you on a spiritual journey into a world of psychedelic music.